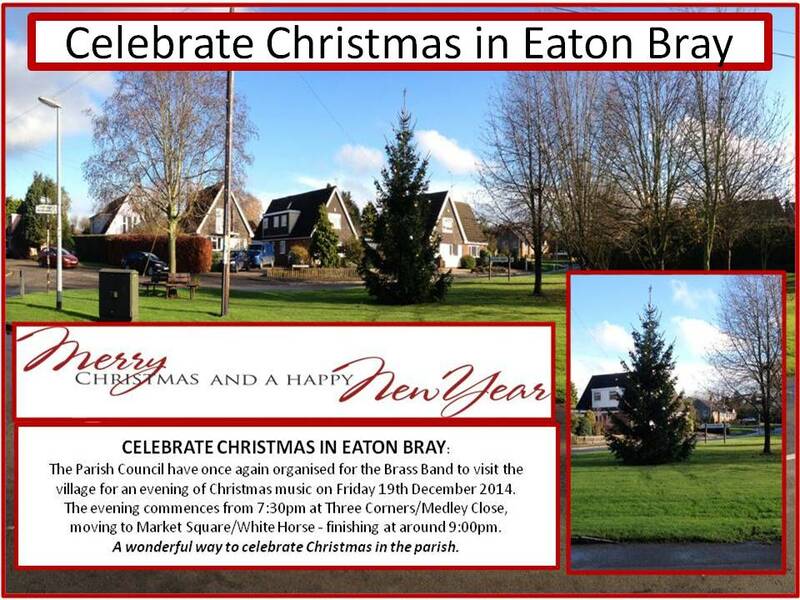 Archives of Eaton Bray News for November 2014. This article was published in November 2014. Please see Latest News for more recent information. The Parish Council have once again organized for the Brass Band to visit the village for an evening of Christmas music on Friday 19th December 2014. The evening commences from 7.30pm at Three Corners/Medley Close, moving to Market Square/White Horse - finishing at around 9.00pm. A wonderful way to celebrate Christmas in the parish. '16 days of Action', is an international campaign that aims to raise awareness about violence as a human rights issue at a local, national and international level. The 16 Days of Action Domestic & Sexual Abuse Awareness Campaign for 2014 takes place between 25th November and 10th December 2014. The theme for our campaign is 'This is Abuse'. The 'This is Abuse' campaign is aimed at preventing teenagers (13 to 18 year old boys and girls) from becoming victims and perpetrators of abusive relationships by encouraging them to re-think their views of controlling behaviour, violence, abuse, sexual abuse and what consent means within their relationships and directs them to places for help and advice. Further details can be found on the Home Office website. Lisa Scott, Sexual Abuse Coordinator and Claire Churchley, Domestic Abuse Coordinator at Central Bedfordshire Council said "Sadly, domestic and sexual abuse goes on all over the world but we are using this international campaign to bring the issue to the forefront of people's minds across Bedfordshire. "We're also hosting a quiz night and a cake sale to raise money for refuges in the local area and to fund valuable advisors that support victims of domestic abuse in Central Bedfordshire & Bedford Borough." If you'd like to get involved, or just for more information, please see the events schedule on the website, or contact Lisa Scott on ext. 75733 (0300 300 5733) or Claire Churchley on ext 75168 (0300 300 5168). 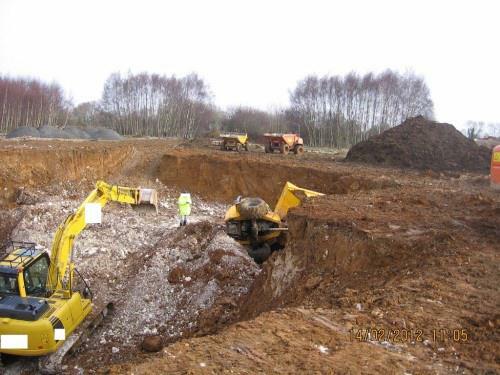 A property development firm and a contractor have been ordered to pay a total of over £180,000 for safety failings after a worker was killed when the dumper truck he was driving fell into a deep and completely unguarded excavation at a former military base in Buckinghamshire. Geoffrey Crow, 48, from Eaton Bray, sustained fatal crush injuries in the incident at the former RAF Chenies site on 13 February 2012. The dumper overturned and landed directly on top of him. He was killed instantly by the five-tonne machine. Harrow-based Lois Gastoneaux Ltd and Michael Brett, a self-employed contractor working on the site at the time, were sentenced on 20 November 2014 after an investigation by HSE identified serious safety breaches in their operations. St Albans Crown Court heard that Mr Crow was working at ground level whilst others were working to excavate a deep basement for a swimming pool at a new build property belonging to the sole director of Lois Gastoneaux Ltd, Mr Kevin Andrews. The dumper went into the large excavation, which was up to 6.5 metres deep, shortly after he had freed the vehicle when it became stuck near the unguarded edge. Mr Crow's colleagues stated they would not usually wear seatbelts when operating the machines. The court was told the range of issues were all contributory factors in the death, and that standards at the site fell well below those expected. Lois Gastoneaux Ltd, from Harrow, Middlesex, was fined £150,000 and ordered to pay £28,033 in costs after pleading guilty to/being found guilty of breaching section 3(1) of the Health and Safety at Work etc. Act 1974 and regulations 37(6) and 31(1) of the Construction (Design and Management) regulations 2007. Michael Brett, of Lodge Lane, Little Chalfont, Buckinghamshire, was fined £2,000 and ordered to pay £1,500 in costs after pleading guilty to/being found guilty of breaching regulation 37(6) and regulation 31(1) of the Construction (Design and Management) Regulations 2007. Speaking after sentencing HSE inspector Stephen Manley, said: "Working with construction plant can be extremely dangerous, which is why appropriate safety measures must be in place at all times to protect workers and others onsite. "In this instance, Mr Crow died as a direct consequence of the lack of controls of the risks involved in the excavation operations. There was no protection whatsoever to ensure workers, whether driving machinery or otherwise, did not fall into the deep excavation. "A number of people were at work with Mr Crow and they were all at risk of serious harm through the absence of physical controls, as well as poor maintenance of equipment and a lack of training and information provided to workers. "There are clear industry standards setting out how to identify and manage risks, and guidance is widely available. So there is no excuse to let operations continue without having the proper health and safety measures in place." If you need help managing construction projects under the CDM Regulations or are affected by the safety issues raised in this article, please contact Ai Solutions about their CDM ToolKit compliance software, or find out more about construction safety via the Safety Matters website. The next Parish Council meeting will be held on Monday 1st December 2014, from 7.30pm, in the Coffee Tavern. Central Bedfordshire Pharmaceutical Needs Assessment (PNA) is now out for consultation. The PNA will be used by NHS England, Public Health and Clinical Commissioning Groups to inform the commissioning of pharmaceutical services. This consultation period is an opportunity to have your say on the future of pharmacy services in your area. The consultation is available from Central Bedfordshire Council's website, where you will find the full draft document, executive summary and online response questionnaire. It is very important to the Council that they obtain the views of residents on the proposed recommendations. Please fill out the questionnaire available with the consultation documents. The consultation period will close on 15th December 2014. You are viewing the November 2014 archive.